I'll admit, breakfast is probably my least favorite meal of the day. (I'm a lunch gal.) Why? I just don't like many breakfast foods. Eggs? Pass. Sausage? No thanks. Breakfast burrito? Definitely not. But one breakfast staple I am always down for? A nice, warm, soft, slightly chewy bagel. Add some fluffy cream cheese and a coffee and you have my favorite morning combination. So, when I was made aware of Einstein Bros. Bagels' newest creation, the Twist N' Dip, I decided to try it. And I love the entire set up. 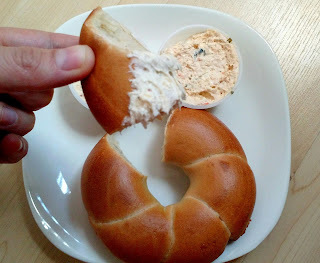 The Twist N' Dip is a bagel lightly perforated for easy piece-pulling. It's a regular flavor bagel that comes with two schmear flavors of your choice. (I chose Honey Almond and Garden Veggie.) Of course the bagel and shmear are delicious --It's Einstein's. But being able to simply dip and alternate between shmear flavors was unexpectedly satisfying. Plus if you follow this link you can get two Twist N' Dips for the price of one! And while you're enjoying your delicious bagel, make sure to snap a pic (or take a video) to share on Facebook, Twitter, or Instagram and include the hashtag #TwistNDip for a chance win tons of fun prizes from Einstein's. Now through July 31st. Stop by your local store to enjoy this innovative breakfast treat. Even this lunch gal can't resist an Einstein's bagel.